Hello and welcome to my blog, wasn't Karen's project amazing, I love how elegant and sparkly her desk calendar is. 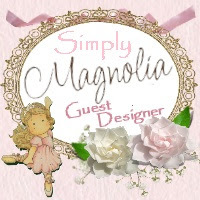 If for some reason you get lost along the way you can always start over at Magnolia-licious Challenge Blog and go on from there. 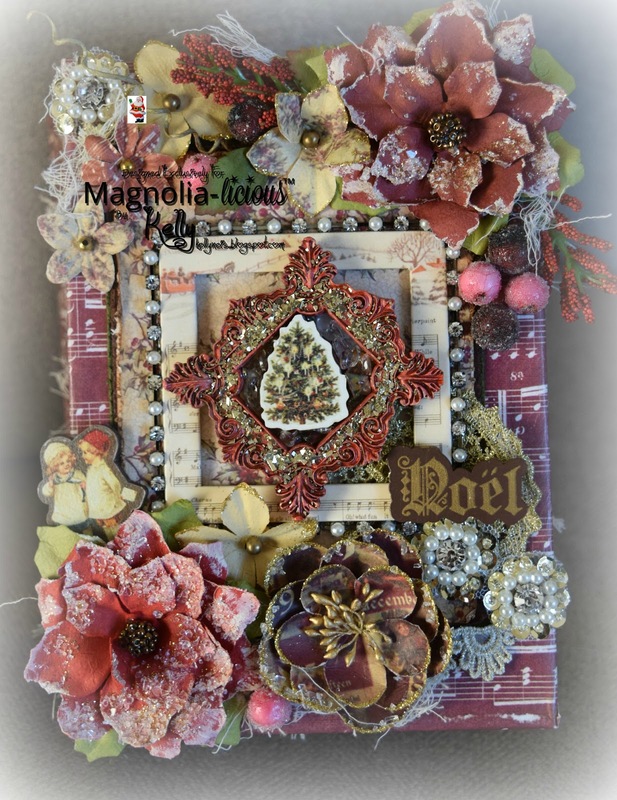 As you know we are having our annual Christmas Magic Blog Hop with 2 chances to win a $20.00 gift certificate from Magnolia-licious, the rules will be at the end of my blog post. I sure hope one of my friends win this one!! 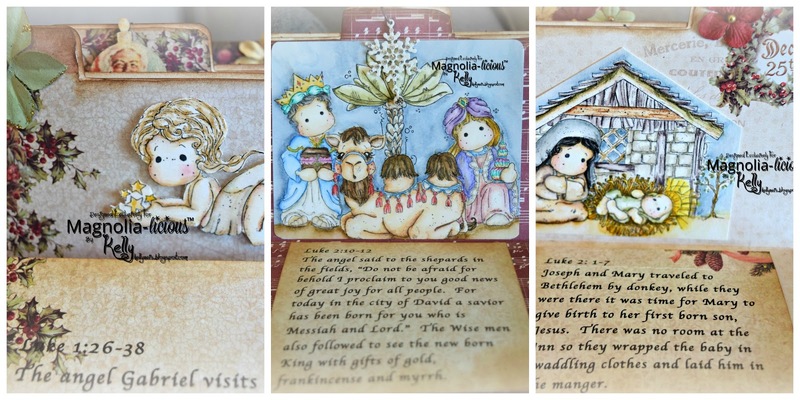 My younger son is learning about the Nativity of Christ and to help him along I decided to make a family book about the Nativity with the help of Tilda and Edwin along with the Nativity scene images which are available at the Magnolia-licious store. If they are not there at the moment, just email Diana and she will order them for you. 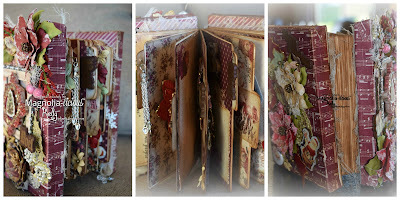 I made this book using 2 5x7 inch canvases and file folders from Tim Holtz. 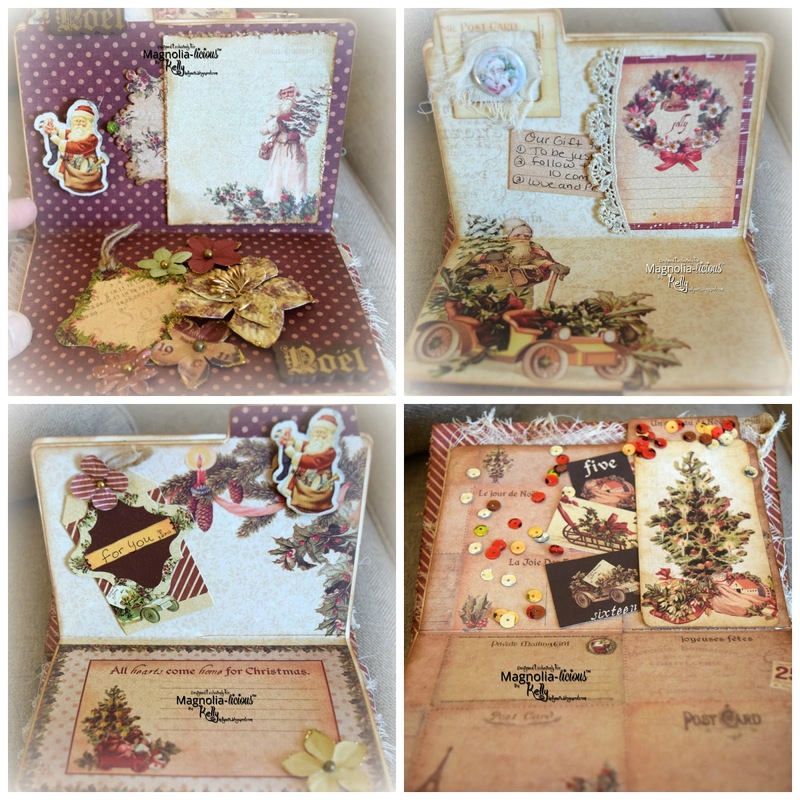 My papers and embellishments are all from Prima's Victorian Christmas and I was inspired by their creator Frank Garcia to make this book. Here are the inside pages of the files with pockets and accessories from the Victorian Collection. The story of Christ's birth is told in a simple kids style so that it easy for my little guy to understand what happened. In one of the folders I have a paper in a pocket "Our Gifts" so we can reflect on the scripture. I colored the Magnolia images in distressed inks and printed out each scripture on the designer paper to match. The first one of the Angel folds out to read. Here are the side views of the book, the back shows the spine and 2 canvases put together with scor-tape and glossy accents glue, it was heavy and wanted to pull away. I decorated the front and back but made sure that either side can be laid down or handle by childrens hands. OK Here Is How You Can Win! 1. Each member of our design team has hidden Santa's and you need to visit each design team member and count the Santa's. After you have a total, email CathyLee at cathylee.co@gmail.com and you will be entered into a random drawing of the correct responses. 2. 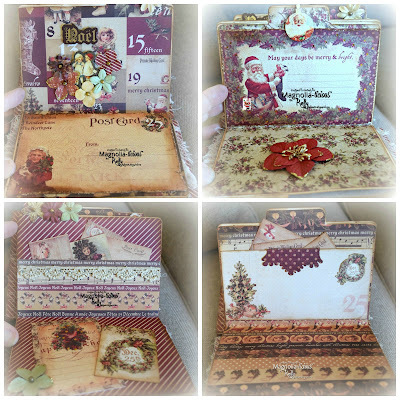 Enter a project (anything but a card) in the Magnolia-licious Blog Hop Challenge and you will have a chance to win the random draw of all the Challenge Entries. 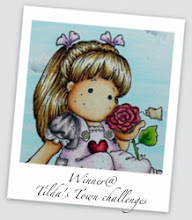 You will have the entire month of November to enter the Blog Hop Challenge. 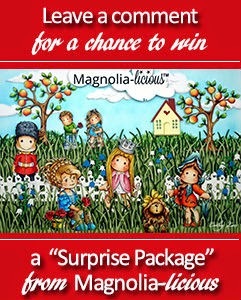 *Like us on the Magnolia-licious Facebook fan page. 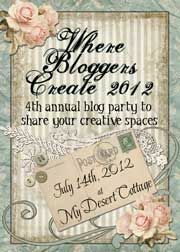 *Leave a comment on each of the design Team's blog hop posts. 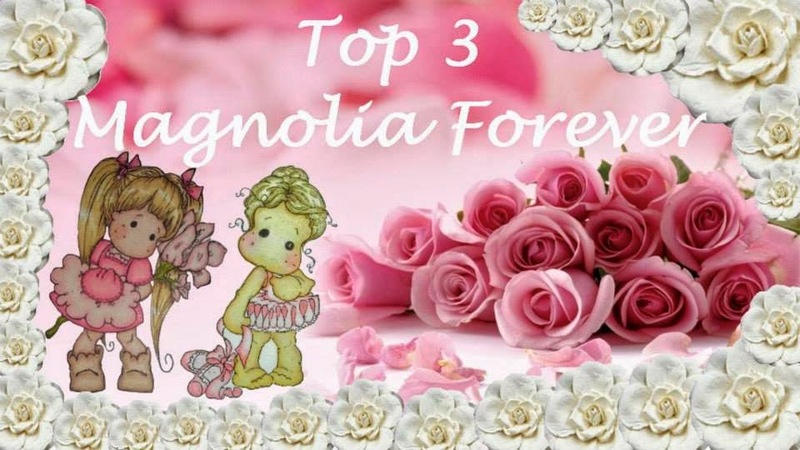 *At the end of your hop go back to Magnolia-licious Blog Hop Challenge Post and leave a comment. Thank you for following along our Christmas Magic Blog Hop at Magnolia-licious! WOW Kelly, such a wonderful Album. Love all the details. OMG.....this is amazing! All the details and all the pages....just perfect!!! Oh WOW ! Fabulous album, so wonderful work !!! Kelly this is so gorgeous! 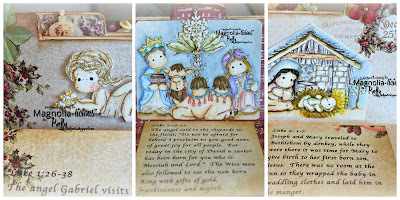 What a perfectly magical way to tell the Nativity story! WOW! Beautiful work. 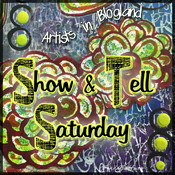 Love all your images and embellishments. What a nice heirloom. Gorgeous album, Kelly. Wow, what a lot of work you've put into this. Love the vintage look. The different textures on the cover is fabulous. It's a keeper for sure. It's amazing! So many beautiful details! Beautiful book! So many pretty details! This is fabulous, Kelly. I can’t even imagine how much time it took to put this together. This is incredible with all of the attention to detail. Truly a treasure. Wha?????? 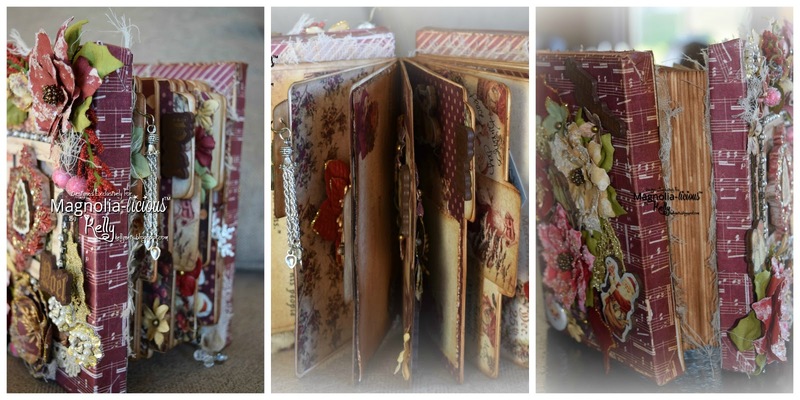 Canvas as book backings...that's more than genius and WOW oh WOW, did that ever turn out scrumptious! Incredible all the details that you added, but I can't stop smiling at the simplest decorated tabs. You are just amazing. This is jaw dropping gorgeous. That's it, it's decided, I'm moving in! I'll sleep under the desk. I don't need much room. I want to watch you create!! Oh My! I LOVE THIS! I love the shabby style and the colors. Using canvases for covers is so clever and I love how you made the pages with file folders. Spectacular Project! Wow, what a fabulous and gorgeous album you have created! There's so much to see and a ton of detail... I have to go back and look again and this super nice creation.